Bat for Lashes opened for Depeche Mode. They kind of reminded me of Siouxsie & the Banshees. Selfie of Alicia and me. Alicia had waited more than 20 years to see Depeche live. Depeche Mode … ten times better show than their 2006 tour. They definitely redeemed themselves. My aunt Linda and cousin Alicia came down to visit me from up north for a few days. Here’s an accelerated version of our activities … lunch at Noodles & Co. — driving tour of Northern Va. — leisurely walk around Mosaic District — dinner at Matchbox — mass at the Basilica of the National Shrine of the Immaculate Conception — tour of the Basilica — Union Market — dinner at Coastal Flats — breakfast crepes at Clifton Cafe — tour of historic Clifton — tour of the National Museum of Natural History — tour of the National Museum of American History — tour of the National Portrait Gallery — dinner and drinks at Russia House — rooftop fun at night on Mass. Ave. — lunch at Good Stuff Eatery — visit to Old Post Office and clock tower — dinner at Bella Vita — Depeche Mode. Nonstop fun! My cousin threw a retirement party for my wise and nurturing aunt who worked tirelessly as an elementary school teacher for years. She’s a rare kind of teacher you are lucky to come across even once in your entire educational career. (Shout-out to my inspirational teacher Eileen Maloney.) Hailing from a large Italian family, my aunt’s siblings enthusiastically showed up in support. My aunt is of deep faith and grew up with nuns as teachers. My Uncle Paul arrived from out of town to surprise her. Dressed as a nun, he showed up early to the party with his back to the entrance. When my aunt arrived another one of my uncles brought her over to the “nun” who he introduced as Sister Lucy. 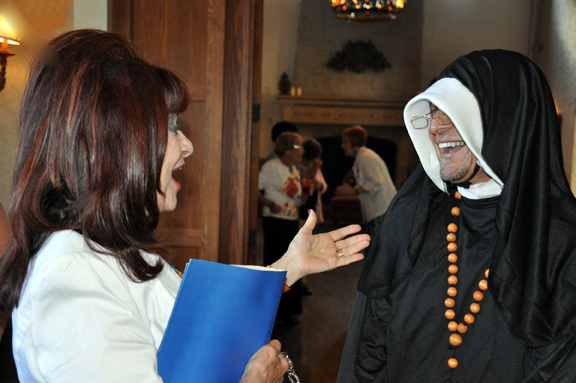 When my Uncle Paul in full nun gear turned around, my aunt was blown away — she started laughing and gave him a big hug. It was super fun coming together to honor her. Enjoy your next phase of life Aunt Linda!